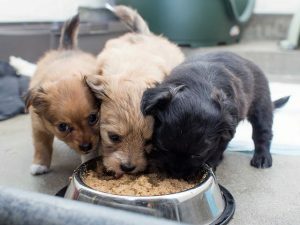 Los Angeles – As you prepare to give thanks, Society for the Prevention of Cruelty to Animals Los Angeles (spcaLA) offers the following tips to ensure that everyone, including pets, has a happy and safe Thanksgiving. While you are out shopping for your family’s feast, consider picking up a bag or can of dog, cat, kitten or puppy food for shelter pets in need. Donations of unopened pet food are happily accepted at all spcaLA locations, during business hours. Turkey skin is fatty as is gravy and buttery side dishes. Long term ingestion of fatty foods can cause pancreatitis in pets. If you must share turkey, cut white meat into small bite sized pieces. Don’t give your pets the leftover bones. Cooked bones can splinter and become lodged in your pets’ esophagus or intestinal track. This can be fatal! Instead, consider purchasing a Thanksgiving dinner especially for dogs or cats, like Merrick’s Thanksgiving Day Dinner (available at the spcaLA Marketplace in Long Beach). Chocolate is a great treat, but not for your pets. Make sure candy is kept out of reach. Eliminate the urge to scavenge through the trash bin by securing leftover bones and bits in a tightly tied plastic bag. Dispose in the dumpster. Remind well-meaning guests to not offer food samples to your pets. Dogs and cats should wear a collar and I.D. tags with current information at all times, in addition to being micro-chipped. This is important throughout the entire year, but especially during the holidays as there may be a greater risk of your pet escaping due to increased visitors. Teach your pet to “come when called.” This command is a fail-safe, should your dog get loose. spcaLA offers a variety of training classes throughout the year. Expecting a full house? Secure your pets in a separate room with favorite toys and a cozy pet bed. Play soft music to help them relax. Pets that have their own room will feel safer, less stressed, and won’t be able to accidentally escape out the front door. spcaLA’s pet adoption centers in Hawthorne and Long Beach, the spcaLA Marketplace, and the spcaLA Pet Hotel & Grooming Salon will be closed Thursday and Friday for the Thanksgiving holiday, reopening Saturday November 24th at 10am. PetSmart Charities™ Everyday Adoption Center by spcaLA will be closed Thanksgiving day, reopening Friday at 12p. Until the end of the year, Pick Your Own Price for cat and kitten adoption fees (for qualified adopters only).